The Ottawa landscaping industry covers a lot of ground and includes everything from designing and building outdoor properties, to cutting lawns, installing flower beds, controlling weeds, pruning hedges, and more. With this in mind, we at Ottawa Home and Garden are very specific about what we do. Ottawa Home and Garden is a full landscape services company insomuch as we are a landscape design and build company who specializes in residential properties. We focus on your needs and wants to come up with an outdoor design that complements your personality and lends a fantastic appearance and functionality to your outdoor living area. As a design and build company, Ottawa Home and Garden takes into account all the appropriate stages of a project, from start to finish. We are specialists who spend 100% of our time on this process of designing landscapes and then building them. In other words, we are not involved with lawn or property maintenance. If outdoor construction is your main focus, we’re your guys! A lawn-cutting company is not equipped to redesign and reconstruct your outdoor living space like we can. Our objective is to design spaces that beautify properties, and then take those landscape designs and implement them during the construction process. We do this using our client’s vision, along with a list of methods that are all dedicated and specific to the construction task at hand. In other words, our goal is to take a client’s vision and find a balanced elegance to their imagination using our many years of experience and proven track record. When it comes time to start building, we switch our focus to the project’s structure. It is important to be aware of the surrounding areas, sub-base and newly installed base if needed. We look to see how the existing sub-base will hold up to the new construction and see what we need to do to make sure the construction process goes smoothly. In Ottawa there are many different grades and sub-grades that need to be considered, such as clay, sand and rock, which may have been used as backfill by the home builder. Experience plays a huge role in identifying existing materials and understanding the situation in order to make the necessary decisions moving forward. Not only can Ottawa Home and Garden sketch out a landscape design plan for you, but we also have the experience to build it properly. As we build our landscape designs, we always take into account the biggest obstacles: frost, water and erosion. Water is not healthy for the longevity of your dream outdoor living space. Creating sufficient water drainage is our priority from beginning to end. We must slope or grade the moisture away from your house. With this in mind, we design the space accordingly. We have been on site to see these structures installed, so we have an understanding on how they are built and as a result understand how it all works. In some cases, we can even design areas to harness rainfall for use in the garden or for use in irrigation systems. When it comes to landscaping services, Ottawa Home and Garden’s main goal is to protect your investment. This means also having a plan in place for potential erosion. In some cases, a retaining wall might be needed. If this is the case, then so be it. But if a retaining wall can be avoided, ultimately we want that, (providing we don’t compromise structure of the project) since walls can eat up a large chunk of a project’s budget. So, when we discuss reclaiming land to use for a patio or lounge area, we address certain requirements, but at the same time we look at ways we can achieve the same goal by thinking outside the box a little, such as by using different materials or construction methods. 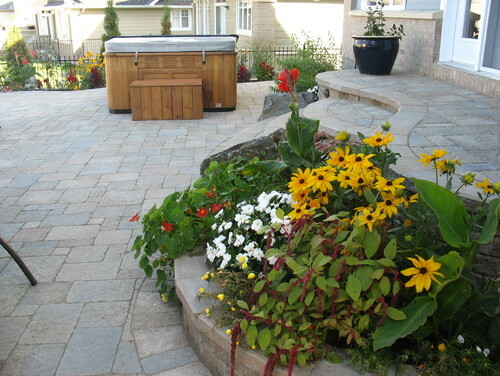 Ottawa Home and Garden prides itself on using our 16 years of landscaping experience and professionalism to create beautiful outdoor living spaces. For more information about our landscaping services, please take a look through our portfolio, and give us a call or email us today. We’d be happy to provide you with a free landscaping estimate and go over your options. We look forward to helping you create an outdoor dream space you will want to show off year after year.